It’s less than one month until Christmas and I’m starting to panic. Are you? If you’re not in a tizzy over the holidays, I want to meet you. And then I want to slap you. OK, so maybe I won’t really slap you, but I’ll give you a very angry look that will either make you ever so slightly uncomfortable or prompt you to offer me an antacid. I’ll take the antacid, thank you very much. Yes, it’s that time of year when even if you’re organized, your plans aren’t worth much because it’s impossible to get around town. The traffic is horrendous — at least by our standards. People from larger cities (Toronto, Montreal, etc.) scoff at the mere suggestion that we even have anything remotely comparable to traffic around here. Commuting 15 minutes to work in these parts is practically considered a hardship. And now with major retailers opening or undergoing major renovations, the traffic will be even worse as shoppers flock to see what all the fuss is about. Many will say they don’t care. I don’t believe them. They care — and they’re checking out all the new places to make their credit cards bleed red ink. From now until Christmas, the stores will be busy no matter when you go. For me, that means I’ll be doing all my shopping at supper time or right before closing. Yeah, I’m going to be one of “those” people who arrive at the last minute to drive store staff up the wall as they look forward to locking up. Then I show up, mess up everything they just folded and arranged on the shelves and run out. No, I really won’t do that. It drives me crazy when I see others do it. I won’t do it myself. You know those people — the ones who show up at the store, see it’s closing in three minutes and grab a shopping cart? One of these days, a stressed-out employee is going to snap, fold up the customer and shove them into the cart and roll it back out to the parking lot with a swift kick. I don’t like buying presents too early. I’m paranoid the receiver won’t be able to return it if they don’t like it if the purchase date is way past 30 days. Then I wonder what I’ll do with that barrel of face cream for good old Great Aunt Mathilda if she kicks the bucket before Christmas? Will I be stuck with it? Should I jar it up and try to donate it to the food bank as mayonnaise? Or maybe start wearing it myself? Would Great Aunt Mathilda be offended if I asked for a medical report from her doctor before buying her a Christmas gift? It would be discourteous of her not to agree, considering her advanced age. Over the next few weeks, between a crazy busy fall in business and getting ready for the holidays, I’ll be lucky to even know my own name come Christmas Day. That’ll be me just sitting there in the corner of the living room on Christmas morning talking to myself and weeping quietly from exhaustion as mascara-stained tears roll down my beautiful satiny-soft cheeks from all that face cream that Great Aunt Mathilda couldn’t use after she fell off that rickety ladder trying to put the star on the tree. Not much use for face cream when you’re wrapped in bandages from head to toe. Even with a glowing medical report from the doctor, sometimes we just can’t foresee holiday-season accidents like that. Falling off the ladder or the roof while putting up decorations. Choking on tinsel. Mistakenly eating a glass ornament made to look like candy. Well, at least it would give you a sparkling smile while you’re in the emergency room getting shards of shiny glass removed from your mouth by a giggling nurse. Speaking of ending up at the hospital after eating Christmas treats, what’s up with those barley toys? Sure, they taste good, but they were not made for impatient people like me who try to chew them or bite off pieces after about five minutes. Those things are made of cement by demented candy makers! What kind of sickos are you, anyway? I’m surprised I have any teeth left. I say we all get in a group hug (Hey, buster, watch your hands!) and hang on for dear life until Christmas Eve at 5 p.m. when all the stores close and the craziness is over for a couple of days — that is, until Dec. 27 when the Boxing Day sales start, when we do even more damage to our credit cards as they scream “Nooooo!” as they’re swiped one more time. Hmmm; atheism is starting to look awfully good right now. 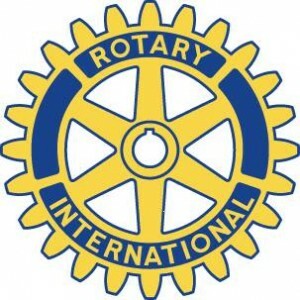 Rotary Dinner and Movie for a Year tickets now available for $20 each! I am selling tickets again this year and must defend my title as the Rotarian who sold the MOST tickets — having sold 126 last year! Please help me keep my title! (Bragging rights only…) These make perfect stocking stuffers with four grand prizes available — each consisting of two movie passes and a $50 gift certificate to a local restaurant for EVERY MONTH of the year! 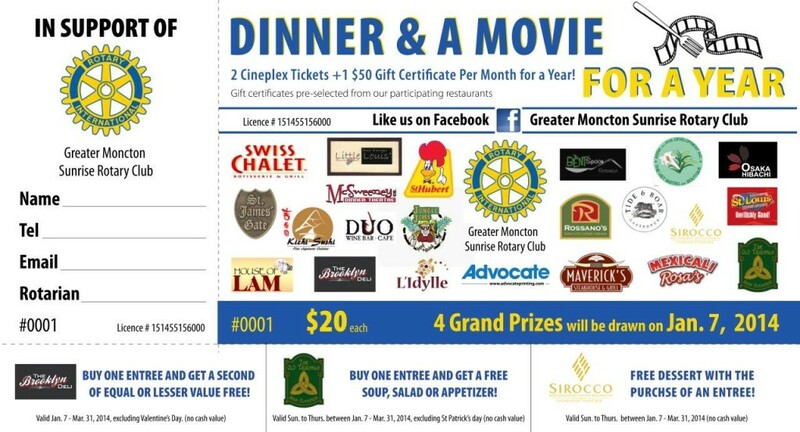 ($600 in restaurant gift certificates + 24 Cineplex movie passes). And if you add up the restaurant coupons that come on every ticket, your ticket ends up being free! 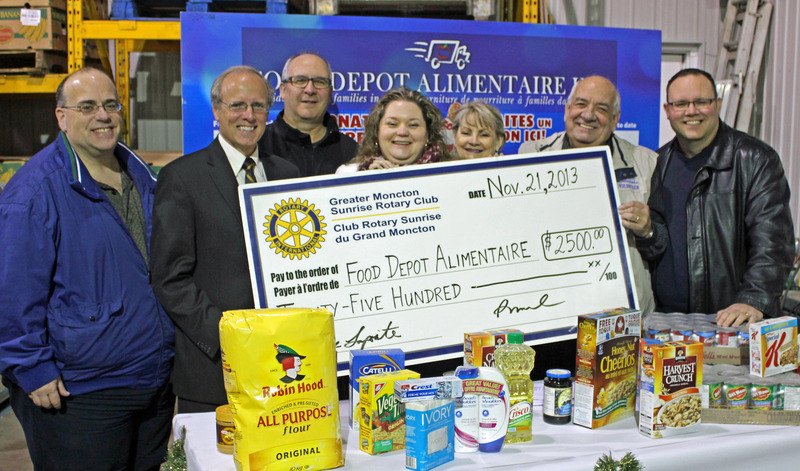 The Greater Moncton Sunrise Rotary Club’s most recent donation to Food Depot Alimentaire was made last Thursday at Food Depot’s launch of the 2013 Christmas Aid Campaign to provide 1,750 Christmas boxes to families in need in the Greater Moncton area. In the photo below, from left to right: Brian Cormier (me), Greater Moncton Sunrise Rotary Club; Moncton Mayor George LeBlanc, who’s also a member of the Moncton West and Riverview Rotary Club; Maurice Henri, Sunrise Rotary Club; Candice Wood, Sunrise Rotary Club; Sharon Ashfield, Sunrise Rotary Club; Ray Gould, Food Depot Alimentaire; and Paul Pellerin, Sunrise Rotary Club. Click on the photo for a larger version. Hump Day: What if the jolly old elf was like some store customers? I’ve often wondered why it sometimes takes the media to get involved before some businesses solve customer service problems. Doesn’t it seem like every time you open the newspaper or turn on the television or radio, we see a story about some poor consumer who’s had to resort to public shaming in order to get justice? 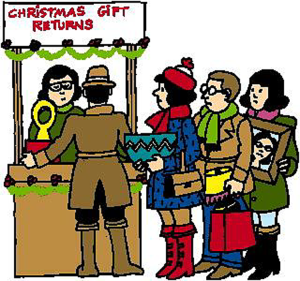 With the Christmas shopping season upon us, we’ll surely be seeing a resurgence in these sorts of complaints. But we must also remind ourselves that the customer isn’t always right. I’ve never been a particularly strong proponent of that old cliché ‘The customer is always right!’ It’s overused and, quite simply, often just completely untrue. Some retailers go above and beyond to please their customers. Of course, I guess that’s how they stay in business, but some should get medals. I remember a story that a friend told me years ago about an incident at a retailer he once worked for during the summer. An older lady came in to return a barbecue she’d purchased. She dutifully produced a receipt but was told she was at the wrong store. “‘Nope, I bought it here.” Not only was the elevator not going to the top floor anymore, but the bees had left her hive, the bulbs had burned out in her chandelier and her carton was a few eggs short of a dozen. Eventually – and likely because they knew they weren’t dealing with someone who was rational, they gave her the refund. Perhaps it was a brand they already sold in the store and they’d just send it back to the manufacturer, I don’t know. But at some point, someone just got frustrated and decided right then and there to give her the refund and get her out of the store before she wasted one more iota of their time. You have to give her an ‘A’ for persistence. I’ve usually had good customer service when I’ve asked for a refund. I’m not one to ask for refunds or return things anyway. An item has to literally be broken or not working for me to return it. This is unlike a few people I know who make a sport of buying and returning things. They’ll purchase a decorative item for their home and try it out for a week to see if they get sick of it. If not, they keep it. If they’re still not in love with it a week later, they just bring it back. I don’t know if not returning stuff is just a “guy” thing. I think it is. When I’m shopping for something, I usually know what I want. I don’t have time to continuously be going back and forth to stores returning things. Like I said, if it isn’t defective when I get home, I usually keep it even if I end up not wanting it. I just can’t be bothered bringing it back. That would explain the enormous number of unused kitchen gadgets I own. Imagine my surprise, though, when I received a new cassette in the mail a few weeks letter with a nice letter of apology telling me that they were more than happy to replace the defective product. I sat there reading their perfectly nice and polite letter and realized that all that adolescent bluster in my letter was completely unnecessary. All I had to do was ask nicely. Actually, that’s usually the way customer service goes. Just ask nicely like a reasonable person and you’ll hopefully be dealing with an equally reasonable person and your money will be refunded — with a smile on their face and a song in their heart. No need for hysterics! Oh, I’m sure there’ll be more than a few hysterics in retailers over the next several weeks. Between stressed out shoppers and inexperienced staff just brought on for Christmas, I’m sure there’ll be some screaming matches. It would be interesting to talk to customer service staff who have to put up with all those returns. I wonder how many have given refunds even though the receipt they were given was from another store? I just know that if I have to return anything to a store this holiday season, it will only be as a last resort. I’ll give the item away if I have to. But if I do feel the need to return something, I’ll try to be nice, polite and reasonable and have my proper receipt with me. I’ll do my best to keep any hissy fits at bay. 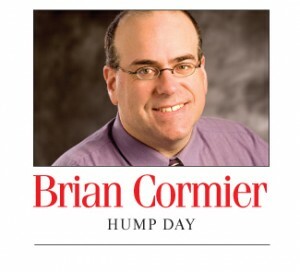 Because if I’m mean, I’m pretty sure there’s a jolly old elf in a red suit who’ll be watching on his hidden camera. And you never want to have him on your bad side. With all the talk about garbage sorting lately, we need to remember how far we’ve come in the past few decades. While there remains a lot of confusion about what garbage goes in which bag in Greater Moncton’s blue-green bag system, I’ll take that any day over the days of yore. There used to be a dump on the banks of the Petitcodiac River. Yup a dump. Actually, it’s still there, just buried. I have clear memories as a kid driving in the car and seeing that mountain of garbage piled high and surrounded by seagulls. I know it’s hard to believe for those of you who either moved to Moncton after it was remediated or were born later, but the thought of an open dump on the banks of the river these days is just unimaginable. With the opening of the Causeway gates, renewed pride in an ever-rejuvenating Petitcodiac River and more sophisticated environmental sensitivities, we just wouldn’t do that in this day and age. We’ve come a long way. When I was a kid, it was nothing for us to litter. Until widespread do-not-litter campaigns came along in the 1970s, we thought nothing of just throwing stuff on the ground. On Sunday drives, we’d just throw garbage out the window — candy wrappers, napkins, etc. Well-used overflowing car ashtrays would just be emptied in parking lots without a second thought. How many times did I see one of my parents crank open that little triangular window (remember those?) on one of the front doors and stuff something through it, only to see it blow away as we sped down the highway? Of course, just the thought of doing that today makes me cringe. And my mother now regularly picks up garbage alongside the roadside on her daily walk to take back home and discard properly. I’ve talked about this to her before and neither one of us would even think of doing the sorts of things we all did with garbage 40 years ago. I often wonder why we even thought it was OK to do so? Perhaps an apple core thrown out the window wasn’t the end of the world. After all, it would just compost back into nature or be eaten by insects of some other animal, but we used to throw out way more than apple cores. Again, it just boggles the mind. These days, people are so much more conscientious about the environment and our planet’s well being. Despite that, though, there are still those who don’t think twice about throwing garbage out their car windows. While my mother never fails to find garbage to pick up during her walks in the countryside where she lives, I often see drivers throw out their still-burning cigarettes from their car windows onto the pavement. Don’t they have a bloody ashtray in their car? I mean, come on! Living across from a park also gives me a first-hand view of the littering that people do. There are garbage cans in the park, but some people just can’t seem to be bothered to use them. I find myself picking up garbage all the time whenever I take my dog for her daily stroll through the park. Broken hockey sticks from the kids playing ball hockey. Empty beverage containers, mostly nonalcoholic, but some alcoholic. Candy and food wrappers. You name it, I’ve found it. So far, no needles, though. I guess I shouldn’t be terribly surprised at the things “some people’s children” do. Over the weekend, I was working in my office and heard a couple of car doors close outside followed by squealing tires. This isn’t a normal thing in my normally quiet neighbourhood, so I got up and took a look outside. It was the middle of the afternoon in broad daylight. I couldn’t imagine what that was all about. I saw five teenage males in the park walking around all tough-like. They weren’t doing anything bad (at least right then), just swaggering around trying to look cool. All of a sudden, I saw four of them stand in a semicircle, hold their hands in front of themselves and look down. Were they praying, I wondered? Were we being invaded by a teenage gang version of the Jehovah’s Witnesses? Come to figure out that they were urinating in unison. What in the world would possess these kids to do that? I understand that if you have to go, you have to go. But all four at once practically watching each other ‘go’? What an odd thing to do in public in the middle of the day, in front of your friends. I mentioned it online and someone mentioned that perhaps it was a gang initiation. I had to chuckle. If you join a gang in the U.S., you have to prove yourself by killing someone. Here in Canada, you prove yourself by peeing in front of your buddies. I guess shy bladders are really frowned upon in Canada’s gangland underworld, eh? Yeah, times sure have changed. I would never dream of littering in this day and age. And I would certainly not consider using the bathroom in front of a bunch of people. I remember the old outhouse at my grandmother’s place in Prince Edward Island had two holes for multiple users. I asked my mother why once. “Well, so two people could go at once.” I was horrified, but maybe those kids in the park would have been right at home. The Muriel McQueen Fergusson Foundation Gala comes to Moncton on Friday, Nov. 29, with a reception at 6 p.m. followed by dinner at 7 p.m. The event takes place at the Delta Beauséjour. This year’s guest speaker is none other than Linden MacIntyre, one of Canada’s most recognizable and respected journalists and a successful author. Tickets are $150 (charitable receipt of $75 issued). Shuttle service available from Fredericton and Saint John. 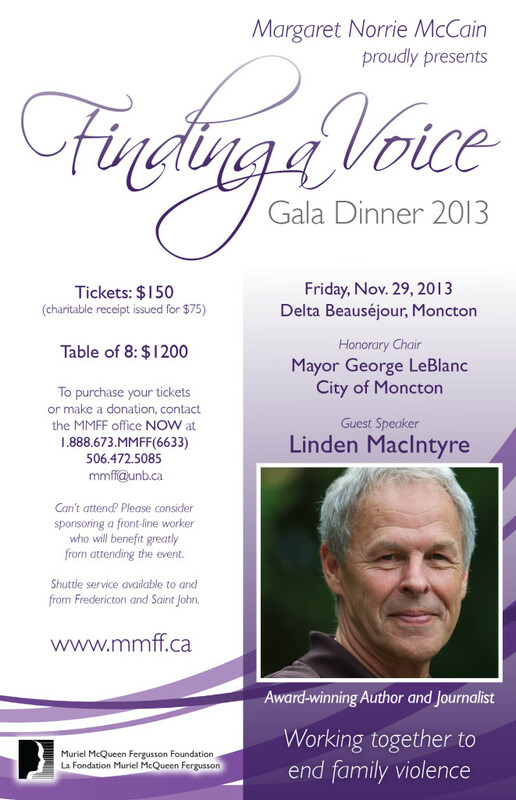 Contact the Foundation office for further information or to purchase a ticket: 506-472-5085, mmff@unb.ca or www.mmff.ca.